Now this title is making me hungry, but that’s not important. What is important is the latest Clinique palette, Strawberry Fudge, which made my day when I started using it on Monday morning. This launch is supposed to be for the Christmas season, but seeing as it contains relatively muted colours, no sparkles and certainly no deep smoldering eyes, this is a different approach from practically every other brand out there. The palette is gorgeous – a silver, swirly delight that really put a smile on my miserable-monday-morning face. I love the sixties feel you get from it and the fact that it’s a bit fun and different, while looking pretty damn fine in my bag. 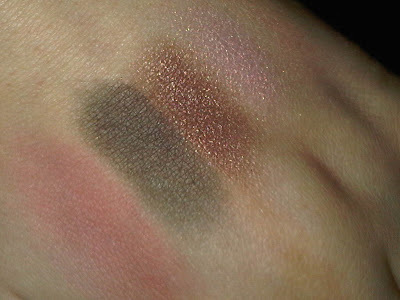 The palette contains three eyeshadows (a pale pink, deeper purple and grey) and a pinky blush. I have to admit I was distinctly underwhelmed when I opened the palette to see the colours, but once I started playing with them I slowly grew to love the hues. The pale pink has a delicate shimmer to it which catches the light and shows hints of a golden colour; the purple is a really great shade to create a subtle smokey look and is perfectly matched with the grey. These three eyeshadows fit perfectly together and create a great effect which can be worn in the day if, like me, you like a bit of ‘oomph’ come the evening. The shadows apply easily, although you do need to build up the colour, and are smooth to mold and blend. They lasted all day and i was so happy with the result I did it all over again the following morning. What I love about this little palette though is the fact is contains a blush… being a pale maiden I need some blush to make me look barely alive, but can’t bear carrying around another thing all day for touch-ups. 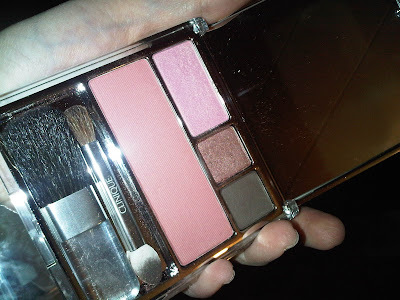 This is perfect as you have everything in one and the blush is subtle enough that it’s pretty much a universal shade. Thumbs up from me.